Home > Cafeterias & Food Courts > How Much Can I Save? Despite how hard you work to attract customers and make great-tasting food at a great value, it all goes away if the last thing your guest does in your restaurant completely grosses them-out. Conversely, if the last thing your customer experiences is a hands-free, quick, clean trash deposit into a container that saves thousands of trash bags, that’s a big plus for customer satisfaction. 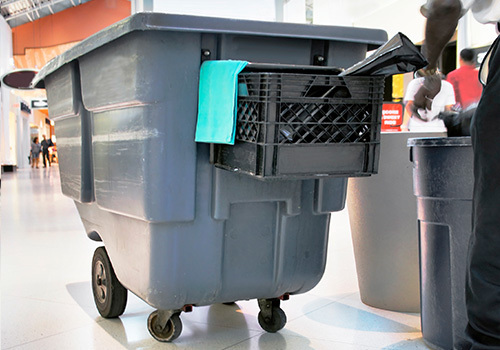 Compacting six trash bags into one with Original ecotrash® reduces trash bag changes by 83%. This means 83% fewer trips through the dining area with “the gray whale” or whatever name you give the container that hauls trash bags from the dining area to the dumpster. It’s a nuisance guests when it’s in the dining area because it blocks the aisle and adds congestion to an already crowded area. The distance from your dining room trash cans to the dumpster is a huge deal. If it’s 100 feet, 300 feet or 1,000 feet, your team spends an inordinate amount of time transporting trash over a long distance. While it’s hard to move the dumpster closer to the dining room, Original ecotrash makes it easy to reduce the frequency of trips and reduce the time your team spends moving trash. Leave the frequent traveler programs for your sales people, and get your trash out of the travel business. Foodservice operators face rising wages and fierce competition to recruit, hire, train and keep quality employees. Each time an employee leaves, it costs $5,846 according to The Center for Hospitality Research at Cornell. Employees LOVE Original ecotrash and LOVE emptying the trash 80% less than before. Automating a mundane task that employees generally hate doing (like trash handling) will not only keep current employees more satisfied, but also give you a point of difference against competitors trying to hire the same candidates you are. “Maybe you know your restaurant is hemorrhaging money by losing employees, but how do you find out just how much you’re losing on a per employee level? The Center for Hospitality Research at Cornell estimates that the cost of employee turnover averages around $5,864 per person for a typical front-line employee. What is the Real Cost of Restaurant Employee Turnover?